Chris Chabot is a Professor of Neurobiology, Physiology and Behavior. His overall interest is in the molecular and physiological basis of animal behavior and he investigates these issues in the field and in the lab. He collaborates regularly with both undergraduate and graduate students and has published journal articles with both. 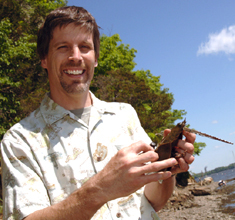 He has received funding for his research on the neurobiological and genetic mechanisms of biological rhythms of horseshoe crabs from the National Science Foundation, National Institutes of Health (through the NH INBRE program), and National Oceanic and Atmospheric Administration (through NH SeaGrant). He welcomes both undergraduate and graduate applicants to his lab. 2017, Simpson, SD, WH Watson, WK Thomas, J Ramsdell, and CC Chabot. The draft genome and transcriptome of Limulus polyphemus. (International Journal of Genomics) Article ID 7636513, 14 pages. https://doi.org/10.1155/2017/7636513. 2017, Anderson, RL, WH Watson III, CC Chabot. Rhythms of locomotor activity in the American horseshoe crab, Limulus polyphemus: Plasticity and variation with tidal regime. Mar Biol 64: 63.DOI 10.1007/s00227-017-3098-9. 2016, Chesmore, KN, WH Watson, and CC Chabot. Genomic and transcriptomic identification of a putative circadian system in the chelicerate Limulus polyphemus Comp Biochem Physiol. 19: 45-61. 2016, Rhythms of locomotion and seasonal changes in activity expressed by horseshoe crabs in their natural habitat, Winsor H. Watson III, Suzanne K. Johnson, Colin D. Whitworth, Christopher C. Chabot. Mar. Ecol. Progr. Ser. 542: 109–121. 2016, Chabot, C.C., N. Ramberg-Pihl*, W.H Watson. Circalunidian clocks control tidal rhythms of locomotion in the American horseshoe crab, Limulus polyphemus. Mar. Fresh Behav. Physiol. 49: 75-91. 2016-2018, $180,000, Biomedical bleeding effects of horseshoe crabs. NOAA, NH SeaGrant. 2015-2018, $228,022 “Molecular and Cellular Mechanisms of Circatidal and Circadian Rhythms”, Principal Investigator, National Institutes of Health INBRE program. 2013, $84,217, NSF MCA Genomics Supplemental grant. “Horseshoe crab biological rhythms, from molecules to movements.” Principal Investigator, National Science Foundation, Integrative Organismal Systems. 2010-2015, $643,900 “Molecular and Cellular Mechanisms of Circatidal and Circadian Rhythms”, Principal Investigator, National Institutes of Health INBRE program. 2009-2014, $312,000 “Horseshoe crab biological rhythms, from molecules to movements.” Principal Investigator, National Science Foundation, Integrative Organismal Systems (Co-PI – Winsor Watson III, UNH, Durham, NH).